This is gorgeous. If you’re a Spider-Man, Gwen Stacy, or J. Scott Campbell fan, you need to add this to your collection. The Marvel(R) Collectibles Gwen Stacy Comiquette (J Scott Campbell Collection) is $269.99 or you can do a payment plan of around $90 a month. Peter Parker’s first true love is the gorgeous and brainy bombshell, Gwen Stacy. 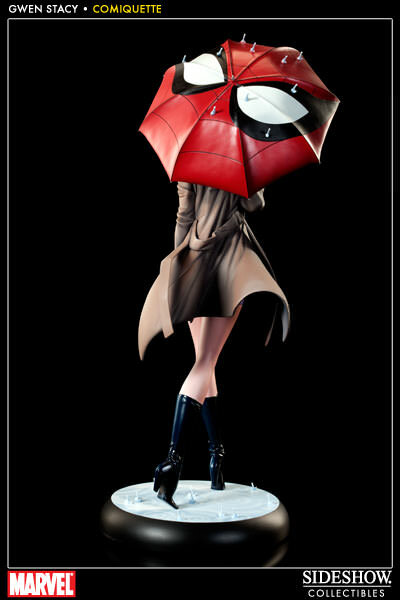 Sideshow is proud to share this one-of-a-kind design from renowned artist J. Scott Campbell. Capturing the vibrant heroine on an afternoon stroll through the rain, her knowing smile and carefree stride suggest that a friendly neighborhood Spider-Man is watching over her wherever she goes. Be sure to add to your J. Scott Campbell collection by checking out the Mary Jane Comiquette as well. She’s $249.99. Happy shopping!